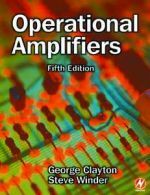 George Clayton's Operational Amplifiers is a well established undergraduate text - offering full coverage of the subject for HNC/HND electronic engineering as well as first and second year degree modules. It has also proved popular in industry as a reference text. Having previously been fully revised by Steve Winder, this classic textbook covers all the latest developments in the field, matched to current degree module syllabuses in both the UK and USA. The introductory sections assume only a basic grounding in electronics, followed by more in-depth material to further the reader's understanding of the subject. Each chapter is followed by a set of exercises, enabling the reader to put the theory learnt into practice, with full answers provided at the back of the book. Appendices feature reproductions of manufacturers' data sheets, placing the concepts introduced in the text into a real-world context, as well as a comprehensive bibliography. This approach, combined with the book's easily accessible page layout and style, results in a highly student centred and comprehensive text. New, updated and expanded topics in the new edition include: bipolar, JFET and MOSFET transistors; voltage regulators; dielectric absorption on integrator, differentiator and S&H circuits; as well as FDNR and Gyrator filters. Fundamentals; Real op-amp performance parameters; Analogue integrated circuit technology; Applications: linear circuits; Logarithmic amplifiers and related circuits; Integrators and differentiators; Comparator, monostable and oscillator circuits; Sensor interface, analogue processing and digital conversion; Active filters; Practical considerations; Bibliography; Answers to exercises. Appendices: Operational amplifier applications and circuit ideas; Gain peaking / damping factor / phase margin; Effect of resistor tolerance on CMRR of one amplifier differential circuit; Instrumentation transducers; Semiconductor data sheets. Index.